The first German opinion poll with all interviews carried out since last week’s outline deal to form a Grand Coalition brings crushing news for the Social Democrats (SPD) tonight. For the first time they sink below 19 per cent of voting intentions, recording their lowest ever score with INSA who carried out the research for the Bild newspaper. Searching the records of other agencies, this would also appear to be the SPD’s lowest score in any national opinion poll since at least 1998. Embattled SPD leader Martin Schulz is now on a tour of his party’s regional organisations to attempt to convince them to back the Grand Coalition agreement at a special party conference in Bonn on 21 January. He is likely to win the Bonn vote, but scepticism about another four years of government with Angela Merkel’s Christian Democrats (CDU/CSU) is widespread in the SPD’s ranks. The wider public is also cooling on the idea, according to other recent polling. The latest Forsa poll for Stern and RTL shows just 45 per cent of voters back a Grand Coalition, compared to 26 per cent wanting fresh elections and 25 per cent behind a minority government. 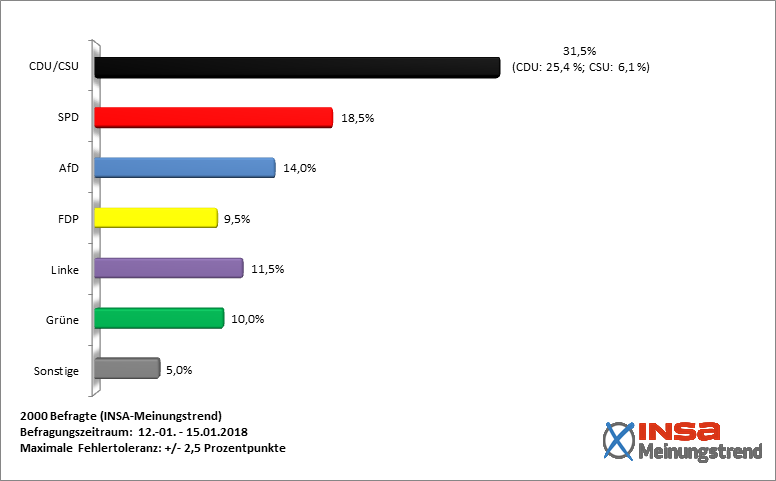 CDU and CSU supporters are much more likely to be supportive of a Grand Coalition than their SPD counterparts (71, 68 and 56 per cent backing respectively), according to Forsa. A straw in the wind from the INSA poll may be the 11.5 per cent score achieved by the left-wing Die Linke. This is Die Linke’s best score with any pollster since the September 2017 election, and while it is only one data point, it could be the first sign of SPD voters drifting to the left in opposition to a renewed agreement with Merkel. Fieldwork: 12.01-15.01.2018. Released: 15.01.2018. Participants: 2000. Method: Online poll. Media partner: Bild. Visit the Insa website here.